Two versions of the smoke generator are available, one for analog operation and the other for DCC operation. The Massoth Pulsed Smoke Generator for Analog Operation is suitable for DC operations. 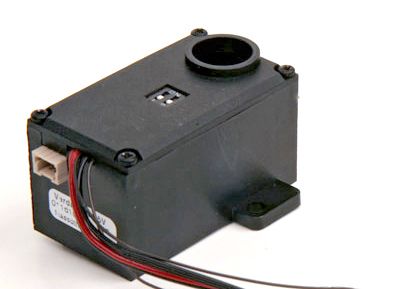 The Massoth Pulsed Smoke Generator for DCC is designed for installation in locomotives already equipped with a DCC decoder. The Massoth high performance pulsed smoke generator for DCC is equipped with a fully integrated decoder that features a standard loco address and a separate programming address. POM programming of the smoke generator (programming-on-main) is thus possible. In DCC mode, the smoke generator's heating element and fan may be independently activated and controlled for optimum smoke effects; several CVs are available for setting temperature of the heating element, preheating of the element, and various fan speed. Load-dependent smoke generation is possible when the generator is connected to the SUSI interface terminal of a Massoth eMOTION decoder. The Massoth pulsed smoke generator for analog operation can only be configured by setting 2 DIP-switches.